In my opinion, no time-travel story is complete without a trip to the Old West. Doctor Who, Back to the Future, Bill and Ted's Excellent Adventure... all of these stories and more travel to the Old West (or the equivalent) at some point. At this point, it's almost a necessity for a serial time-travel adventure story! Thus, the Legends travel back to 1870 to hide from the dreaded "Hunters." But, as always, they get involved with the people and place of that time... and well, things get interesting. To the hitching post! After last week's episode felt like a filler, this episode had me "yee-hawing" and "yippi kai ay-ing" throughout the events. The Old West is high on my list of favorite time periods, so I always enjoy when modern characters travel back to the Old West and act like buffoons. (Yes, I'm looking at you Marty "Clint Eastwood" McFly.) This episode completely satisfied me with all the characters and the side trails they found themselves dealing with. Oh, and there's also Jonah Hex. Jonah Hex is a familiar name for DC Comics fans. He's a bounty hunter of the Old West, who makes it his mission to protect the innocent. I didn't know much about him previously to watching this episode (and I still don't know much about him either), but I had heard his name before. So it was a little exciting to see yet another character enter into the DC-CW universe. (Hex yes! I'm not even sorry.) While he helped the Legends with their side missions, there wasn't a whole lot to him or his character. We got a little bit of background through Rip's past, but mostly, the introduction of Jonah Hex was kind of disappointing. I think I expected more out of him. Perhaps he'll come back again in the future (or the past) to interact more with the story. Still, the connection to Rip Hunter was interesting. Jonah Hex wasn't at all surprised that the Legends were time-travelers--he actually even guessed it because he'd met a time-traveler before: Rip. It was refreshing to find a character that could identify time-travelers. Rip's past with the Old West fit nicely into his story arc. (It also explains the coat, which apparently was Jonah Hex's at one point.) Rip's personal ties to the Old West were interesting, bringing more conflict to his character. And Arthur Darvill, once more, sold it. I was especially excited that Rip participated in the "quick draw," which is also a necessity for a wild west story. Showdown time? Hex yes! Ray: "We might've gotten into a bar room brawl back in town." Rip: "Well, that was entirely predictable." Jonah: "One of them poured lead into a member of the Stillwater gang." Rip: "Oh, that was gonna be my next guess." The other characters also dealt with substantial plots throughout the episode. Stein helped a boy with tuberculosis--or consumption--by giving him modern medicine. It was touching that Stein wouldn't give up on the boy even though he didn't even know the kid or his mother. It really showed a strong point of heroism within the episode: not letting anything stop you from saving a life. It was also super cute that the boy was H.G. Wells... I bet Stein was just fanboying inside. Ray "John Wayne" Palmer's side plot of becoming sheriff to "run" the gang out of town was downright hilarious. He is the biggest dork, and I will never be over his adorable cupcake-ness. He was so gleeful whenever he had an opportunity to quote a western film or talk like the "natives." Plus, his outfit was downright cute. (All their clothes were wonderful. I just wanted to wear all the Old West clothes.) But it was also heroic to see him stand up to the gang--even with the threat of death or worse. He didn't let the bullies win; he stood up for a town he didn't belong to. (Hex yes!) It was awesome. Plus, Snart had his back the whole time. Snart was on point with his gun shots. Hex yes! Ray: "Look, this town is being terrorized by the Stillwater gang. And I aim to do something about it." Rory: "You 'aim to'? You getting all native on us, Haircut?" Mick was also fun to watch in this episode. I think he's finally on decent terms with the rest of the Legends, which makes me happy. He had a drinking contest with Sara, which was perfect. I love their pair-ups because they're both these sort of redeemed, sort of ruthless people. I feel like they can relate to each other a lot, which makes their interactions fun to watch. (Also, I think Mick and Jonah would get along if they were from the same era.) The entire bar brawl was possibly the best part of the episode (except maybe the showdown). I guess it can't be a good Old West story without a good ole bar brawl. Drinking, cards, fighting--this episode had it all. It also had another Kendra's-going-crazy moment. But this one was different. I really enjoy getting glimpses of Kendra's past lives scattered throughout the show. This time, Kendra actually meets herself--an older, crazy woman version of herself. It was an interesting twist, which helped break up the monotony of other visions she's had. (Hex, yes!) Plus, this helped further the plot of Kendra and Ray's relationship. While Kendra's Old West self might end up being right, I loved that Sara stood up for Ray. She deserves an award for what she told Kendra about Ray. It was nice to see. Sara: "Look, I get it. Things may have gone very wrong for Old West you and whoever she loved who wasn't Carter. ... 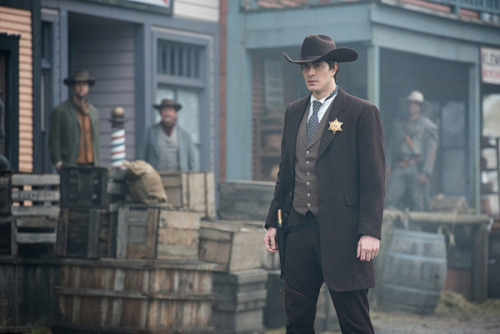 But Old West you didn't know Ray Palmer. She didn't love Ray Palmer. You do. And you have to live your life. She already lived hers." Snart: "This town's seen a lot of interesting. Suppose you got one of those doohickeys that erases people's memories or something?" Rip: "No. But skepticism and disbelief are a far more effective tool." Snart: "So if anybody here talks, no one will believe them." Rip: "Would you, Mr. Snart?" Overall, this episode was one rip-roaring adventure after another. None of the side plots felt out of place, and they worked well to give most characters a spotlight. I loved the era and the clothes and the concept. My favorite thing about this show--other than the characters--is that they get to travel to so many different places. The past, the future, the Old West, the groovy 60s--I love it all. Again, this show reinforces the idea of "heroism." Rip Hunter himself said that the Old West was an era full of opportunities for heroism. It's why he had to pull himself away--because he felt a call to be heroic. This episode proved this through the several different story threads. In addition, it proved that the Legends can be heroic themselves through their actions. They didn't give up on Jax, the town of Salvation, the boy with consumption, or even Kendra's past. They worked together--as a team or in pairs--to be heroes for both big problems and little problems. And I think that's the most important thing this show can offer: a new definition of heroism. Hex yes! What did you think of "The Magnificent Eight"? React with me in the comments!